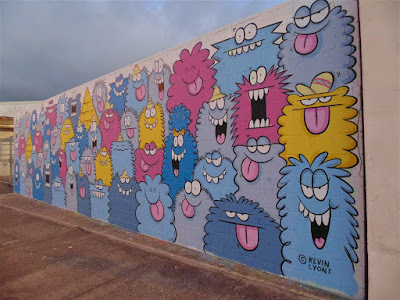 We continue our Pow Wow Hawaii series with this cat mural from Kevin Lyons. Lyons has worked with such clients as Nike, Converse, Coco-cola and American Express. He is also the former global Creative Directory for Urban Outfitters. I really like this mural of cats with all their varied expressions. 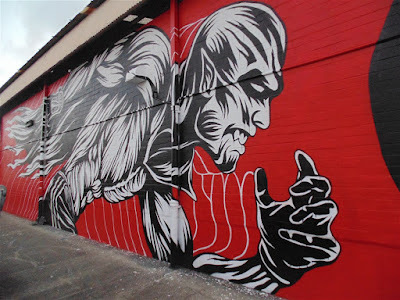 Be sure to drop by Kakaako to check this one out its next to Modern Waldron Park by Pohukaina and Cooke streets. 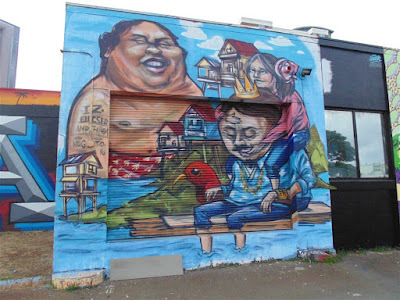 Next we have this mural by Seher One. He grew up admiring the graffiti on the walls in the capital city of his home country of Mexico. He is a big fan of color, bizarre forms of surrealism and fantasy world which shows in his artwork. This mural is entitled “Allegory of Time & Space II”. Next up is this “aloha For All” piece by @elicserelliott” from Canada. This piece was inspried by the life and music of Bruddah Iz who most of you know from his rendition of Over the Rainbow. The red bird is the’I'iwi or scarlet Hawaiian honey creeper.